Do you have any idea how they go about estimating this? No idea. Some guy in Wyoming probably just makes it up. Source, please. Is that based on a 6000yo world theory or what the archaeological/fossil evidence presents? I looked at Wikipedia and from 10,000 BC to 1AD and added up the number of people estimated to be alive at each thousand-year interval which gave a number of 446m people. Then, following the same path from 1,000AD to 2000AD there were 6,380m people. That would put the percentage at about 7%, which should be a viewable block on the pie graph. 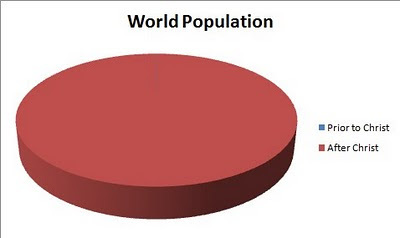 If you include the number of people alive at 1AD on both, you get 6,580 people alive after, which puts the percentage still pretty close to 7%. This is, of course, only counting the people estimated to be alive at specific chunks of time. And of course there have been more people alive since 1AD than before as technological and medical sciences progressed. But as far as I can tell, the numbers on your graph are wrong and seem arbitrary. Love truth, treasure truth, it's a virtue to admit when one was misinformed. Did you see my self-effacing comments on the reliability of these numbers?